Are Artificial Fishing Lures Effective for Trout Fishing? Which Lure should I choose? Meta Description: Trout fishing can be adventurous and interesting. However, if you want to land trout successfully, you should take a closer look at our roundup of the best trout lures. All we obsessed anglers know that trout fishing can be both adventurous and addictive. The intelligence and strength of that fish will give you innumerable unforgettable “fishing moments.” As always, any fishing technique needs the appropriate tackle, so we are gonna present the best trout lures ever. The truth is that several fishers spend a lot of money to buy needless equipment. The media tend to glorify some modern lures and tackle, and unfortunately, many of us relent. Fortunately, we are aware of these traps and tried to present some useful tips. Moreover, we compiled a roundup of the five best trout lures which have some essential characteristics mentioned in the tips section. Before we start analyzing anything, it would be a good idea to learn some things about trout. Trout is not a single fish. The word” trout” refers to a family of fish species that live in fresh waters. Surprisingly, there are many fish species, so we are going to talk about the three most popular. Rainbow, brown and brook trout are the most popular and plentiful species. These fish usually stock in streams, rivers, and lakes. The best location to catch trout is where the lake meets the stream. Furthermore, they love cold waters, and they feed on worms, leeches, insects, flies little minnows and shades. Many anglers would agree that the fish can reach the weight of 10 kg, but a one-kilo fish is considered to be a nice catch. Gone are the days, when live baits were the only baits that could attract trout. Nowadays, the modern technological fishing advancements can construct lures that are tremendously successful. Consequently, you can find a plethora of good trout fishing lures. Trout is an aggressive and active fish, and it is attracted by the fast and abrupt motion of the lure. However, this is not the rule as we are talking about three different trout species. For instance, for rainbow trout, you will need different lures than for brown trout as they have different habits. Also, if you want to land a trout successfully, you should combine the lures with a light fishing tackle. Trout fishing is a fine art, so you have to be delicate. First of all, when it comes to trout fishing, spoons take the first place. Despite the fact that spoons have a simple construction, they are effective and functional. While you retrieve a spoon, it twists and flashes due to the metal construction. They look like the round part of a simple tablespoon and they come in different colors and sizes. If you are going to use the trolling or spinning technique, you should select a flatter spoon that normal spoons. This shape will give your lure a fast movement creating vibrations and ripples in the water. However, the jigging technique needs a curved spoon with an oval shape. This will make the lure more appealing as it will make zic zac movements. As far as fishing times are concerned, you can use them all year long. However, they are more effective during the summer due to the sun. Tip 1#: If you are going to fish in streams, it would be a good idea to use a lightweight spoon due to the shallow waters. Tip 2#: Furthermore, oval spoons tend to be hydrodynamic. This feature boosts the visibility in murky waters as it spins faster and produces a flash. Unsurprisingly, many anglers think that spinnerbaits are exclusively trout lures. True to them, they should certainly be in your fishing arsenal. These lures have an odd construction and can spin in the water by creating vibrations. Moreover, they have a metal blade leaf which also spins in the water while you retrieve line. Due to the combination of these two, the fish will not overlook a spinnerbait. If you search the market, you will figure out that there are many spinnerbaits with hundreds of blades and hook decorations. Tip 1#: Each spinnerbait design is created for different water conditions. For example, you should avoid spinnerbaits with threads if you are going to fish in moving waters. The stream could easily reveal the hook and scare off trout. Tip 2#: Colorado blades are suitable for deep lake waters, and widdle blades are ideal for shallow rivers. If you observe the nutritional habits of trout, you will find out that small fish are on their menu list. Consequently, if you know the adage “match the hatch” you must know that stick baits are ideal imitations of small fish. Besides they have the shape of small fish, they also imitate the colors and movements. Additionally, they have a bib (lip) on the front side which helps them to move in deeper water columns. As far the size is concerned, it depends on the target fish. They only work well in deep murky waters. Tip 1#: You can choose between “floating” and “sinking” types which define the water depths of the lure while you retrieve. Tip 2#: There are hard and soft stickbaits on the market. Remember that soft stick baits have a great action in the water and imitate a wounded fish. Hard stick baits have the advantage of fast hydrodynamic motion. Undoubtedly, trout fishing has a bunch of loyal fans. They fish trout exclusively, and they know all the secrets. After speaking and consulting these anglers, we came to the conclusion that fly fishing is the ultimate fishing method for trout. These lures look like flies sitting on the water surface. Obviously, this is an irresistible nibble for every trout. In this case, trout can be aggressive. If they notice an insect on the water, they strike immediately like a bolt of lightning. The question here is not the suitable weight or water conditions. Obviously, you can fly fishing in streams and rivers with clear waters. The most difficult part is to select the appropriate color of the fly lure as you have so many options. Some people think that fly lures should approach the appearance of the environment. But others, by contrast, suppose that fly lures should have contrasting colors. The right perception meets somewhere in the middle. Tip 1#: It would be a good idea to select fly lures with colorful threads and feathers. Tip 2#: The lighter, the better. That is a rule you should follow when it comes to fly lures. Most of them are going to be used on the top water surface so they should imitate insects approaching the water. The location and depth are two important factors that affect the target fish size. For example, if you are fishing in a stream for rainbow trout, the average size is quite small (proximate 30cm). On the other hand, if you are fishing in a deep lake you will probably catch a 1kg brown trout. Consequently, depth plays a significant role as far as size is concerned. Moreover, keep in mind that small trout are aggressive. According to that, if you are going to fish in a deep lake you have to be patient. Big trout are very tentative, and you have to persist for many hours. Furthermore, small trout are biting quickly and strong. You do not have to put much effort while trout fishing. Once they notice the lure, the will attack it. Big trout are lethargic, so you will feel weak bites. Tip: If you are fishing for hours without any success, you should probably change the hook and replace it with a smaller one. Small trout may be aggressive, but they do not have a large mouth. If they notice that they cannot eat the bait, they will swim away and never come back. This lipless lure designed by the finish company Rapala is exactly what you need for long distance casts. Once you throw it in the water, you will be surprised by the realistic fish motion. Furthermore, it has two sharp trebles to secure your trophy catch. Action: Undoubtedly, the Rapala Rattlin Lure is designed for fast retrieve. The extraordinary motion looks like a real wounded fish. So, you must always keep an eye on the lure. Rattling Effect: These lure series have the unique rattling effect. The wobble and the noise awaken the curiosity of the fish. Sinking Lure: It is constructed to be fished in deep waters. Hooks: The trebles are made of nickel which is a durable rust resistant material. Tested: Obviously, Rapala tests the lures before launching them. The Rapala Rattlin 05 lure deserves a place on the list with the best trout lures. Rapala tests all the lures, so you can be sure that it works great. However, it is quite heavy, but the rattling effect makes it extraordinary. Odd appearance and abnormal motion and sound work really appealing for all trout. This Storm WildEye Swim shad will stand the test of time. It features a soft body with a realistic shad look. The only little problem here is that trout will strike and you may lose the hook. Fortunately, Storm foreshadowed that this may happen, so they put three of them in the pack! Realistic Appearance: As you already know, shads are an irresistible meal for trout. This lure looks tremendously similar to a shad, so it is a sure trout “magnet.” Moreover, the lure utilizes realistic eyes. It is lightweight. This could have a negative effect on the motion. Finally, you should not overlook this soft stick bait. It may seem to be small and cheap, but after testing it we can ensure you that it works great! The soft body gives you many benefits, especially for trout fishing. The revolutionary Heddon Company once again constructed a lure that works wonders for trout. It can stand up to big trout as it features a strong material finish. Stop and retrieve with abnormal movements is a great way to work the lure. Trebles: The eye-catching lure has ultra-sharp trebles which surely increase the catch success. Not only the shape and material are excellent, but also the amount of them increases the fishing efficiency. Diving Style: There is no doubt that topwater lures are not overlooked by trout. Keep an eye on the lure, because the fish strikes quickly. If you are looking for a simple good lure, this is a quite good selection. Most fishing lures have only two trebles. However, this one utilizes three of them, and of course, that fact increases the possibilities to catch a fish. You have, to be honest. Once you saw the photo if this lure, you were surprised by the realistic bug look. It is scientifically proven that bugs are very efficient when it comes to trout fishing. If you pair it with light fishing tackle, you can be sure that it is one of the best trout lures ever. Versatile lure: The Rebel Bumble Bug lure can be fished with different methods. Consequently, you can use it as a topwater lure or even as a stick bait. Both work brilliant. Diving Depth: You can use it as a topwater lure. However, if you are a “deep” fishing fan you can use it as a stick bait and it will reach the depth of 2 feet. Finally, if you are seeking the best trout lures, this buddy should be in your collection. The leading lure Construction Company, rebel once again incorporated all modern features in one lure. They know exactly the nutritional habits of trout. Keep in mind that the fishing lure will work great only if you combine it with a lightweight fishing rod and line. On the first place, fly lures are the best trout lures ever. 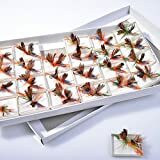 The 48 Blisswill Butterfly fly lures will surely fulfill all needs of every modern fly fishing enthusiast. They are all made of high-quality feathers, hooks, and threads that will last for many fishing trips. When you think about fly fishing, the first image that crosses your mind is a fly. Blisswill knew exactly the demands of fly fishing and managed to create these wonderful flies. Attractive Feathers: The feathers have different colors. Every fly has a different color feather. It is widely known that bright colors attract trout. Hooks: 8 Hooks are ideal if you do not want to lose any fish. Handmade design: The feathers are mounted on the hook with colorful threads. This design is handmade. You can notice it from the careful tie on. Summarizing, many anglers would agree that flies are one of the best trout lures because they look like insects. With this colorful and beautiful design, you will lose no trout strike. Despite the fact that a big part of the hook is not hidden, this will not affect your fishing efficiency. Finally, trout fishing can also be described as a fine art. Undoubtedly, you will need delicate equipment and fast retrieve. Trout are both aggressive and clever, so they will not strike if they do not like the bait. Consequently, not all lures are suitable for trout. Thus, the selection is a difficult part. Hopefully, we were able to make things clear. If you follow the guidelines one by one, you will face no issue with the trout lure. If you like the article, please share it or leave a comment in the comment box.